Layfield's Silt Bag is a geotextile filter bag for removing silt from water. The Silt Bag is designed to filter water as it is pumped from a storage site, removing hazardous materials such as silt before they can damage the environment. 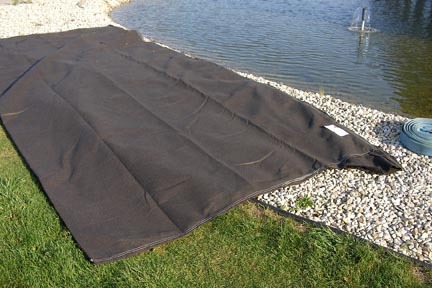 Layfield's silt bag is an economical choice for preventing costly clean up of a storm water system. The potential liability from adding silt to an aquatic ecosystem makes the silt bag a valuable environmental protection tool. Layfield's Silt bag is generally constructed from a sturdy nonwoven geotextile such as LP6 or LP8 and comes with a fabric flange fitted for 6" hose. Once fully drained, The Silt Bag and it's contents can be disposed of as a solid waste, an economical alternative to waste water or sludge disposal. The contents of the Silt Bag can also be returned to the soil on your site, eliminating waste disposal costs altogether. Erosion Control Blankets (ECBs) are used as a means of protecting open soils from erosion and promoting the establishment of a permanent vegetative cover. Silt Fence is a temporary silt control device that helps to prevent the loss of silts from a site during rain, or other run-off events. Layfield Spring Berms are pop up berms that are capable of reducing the runoff and erosion in storm channels and highway ditches. Floating turbidity barriers control suspended solids and turbidity in water generated by dredging and disposal of dredged material. Turf Reinforcement Mats (TRM's) provide long term support for vegetation subjected to highly erosive conditions. Wire Backed Silt Fence incorporates an effective filter fabric supported with a durable 14-guage wire mesh.